As far back as I can remember, the pickle jar sat on the floor beside the dresser in my parents' bedroom. When he got ready for bed, Dad would empty his pockets and toss his coins into the jar. As a small boy, I was always fascinated at the sounds the coins made as they were dropped into the jar. They landed with a merry jingle when the jar was almost empty. Then, the tones gradually muted to a dull thud as the jar was filled. I used to squat on the floor in front of the jar and admire the copper and silver circles that glinted like a pirate's treasure when the sun poured through the bedroom window. When the jar was filled, Dad would sit at the kitchen table and roll the coins before taking them to the bank. Taking the coins to the bank was always a big production. Stacked neatly in a small cardboard box, the coins were placed between Dad and me on the seat of his old truck. Each and every time as we drove to the bank, Dad would look at me hopefully. "Those coins are going to keep you out of the textile mill, son. You're going to do better than me. This old mill town's not going to hold you back." Also, each and every time, as he slid the box of rolled coins across the counter at the bank toward the cashier, he would grin proudly "These are for my son's college fund. He'll never work at the mill all his life like me." We would always celebrate each deposit by stopping for an ice cream cone. I always got chocolate. Dad always got vanilla. When the clerk at the ice cream parlor handed Dad his change, he would show me the few coins nestled in his palm. "When we get home, we'll start filling the jar again." He always let me drop the first coins into the empty jar. As they rattled around with a brief happy jingle, we grinned at each other. "You'll get to college on pennies, nickels, dimes and quarters," he said. "But you'll get there. I'll see to that." 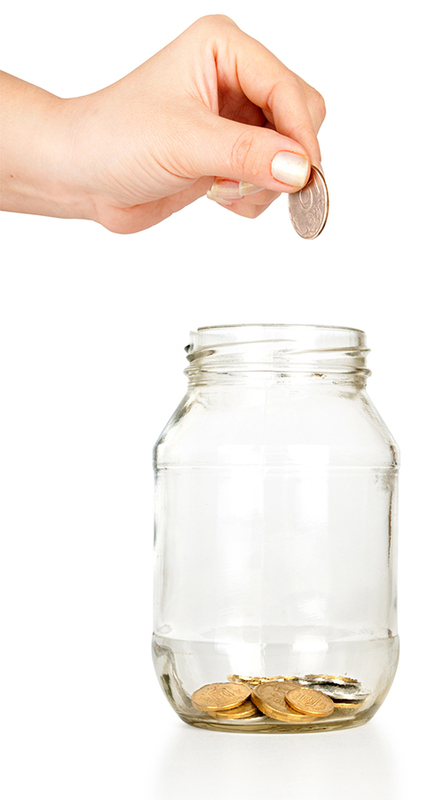 No matter how rough things got at home, Dad continued to doggedly drop his coins into the jar. Even the summer when Dad got laid off from the mill and Mama had to serve dried beans several times a week, not a single dime was taken from the jar. To the contrary, as Dad looked across the table at me, pouring catsup over my beans to make them more palatable, he became more determined than ever to make a way out for me. "When you finish college, Son," he told me, his eyes glistening, "You'll never have to eat beans again - unless you want to." When Susan came back into the living room, there was a strange mist in her eyes. She handed Jessica back to Dad before taking my hand and leading me into the room. "Look," she said softly, her eyes directing me to a spot on the floor beside the dresser. To my amazement, there, as if it had never been removed, stood the old pickle jar, the bottom already covered with coins. I walked over to the pickle jar, dug down into my pocket, and pulled out a fistful of coins. With a gamut of emotions choking me, I dropped the coins into the jar. I looked up and saw that Dad, carrying Jessica, had slipped quietly into the room. Our eyes locked, and I knew he was feeling the same emotions I felt. Neither one of us could speak.